The Dana-Ridge wet blast process is a unique wet blast finishing process. The Dana-Ridge wet blast process utilises an abrasive media, water and compressed air to induce a scrubbing action on the surface of the material being processed. It is sometimes referred to as slurry blasting or (sometimes incorrectly) vapour blasting. The Dana-Ridge process uses a glandless slurry pump to recirculate a wet slurry (abrasive particle, surrounded by the water) around the cabinet and onto the work surface. The compressed air added to the slurry mixture regulates the degree of water cushioning of the abrasive pushing against the workpiece by varying the air pressure and volume of compressed air. The higher the pressure and volume of compressed air, the more aggressive the Dana-Ridge wet blast process becomes at processing the work surface. This control on how gentle or aggressive to process the material surface gives great flexibility. The heart of the Dana-Ridge wet blast process is our unique glandless, slurry pump. The pump design is specific for wet blasting, without bearings, seals, or packing. The interior parts of the pump, including the housings and impellor, are bonded with abrasion-resistant polyurethane to give it a long and relatively maintenance-free life. The pump is mounted to the base of our purpose-designed, steeply-sloped slurry hopper located within the machine enclosure. The angled hopper smoothly and quickly channels the suspended media back to the pump suction. Our pump and slurry pipework are mounted on the outside of the hopper for ease of maintenance and to maximize the interior space. 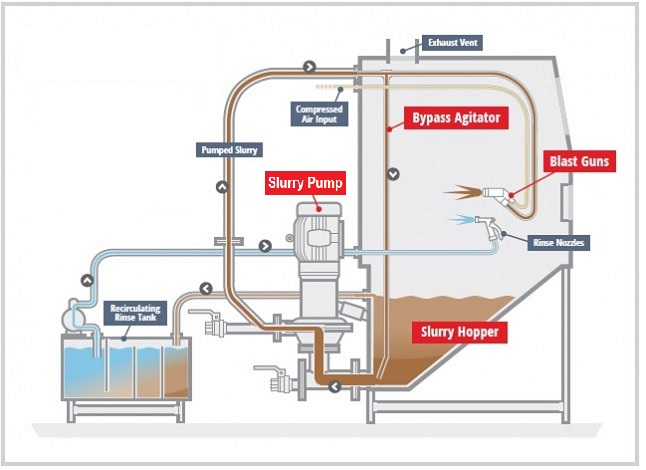 In operation, the pump draws the media and water mixture out of the bottom of the hopper and pushes it at a constant low pressure but high volume to the Dana-Ridge wet-blast gun. Prior to delivery of the slurry to the blast gun, a portion of the pumped slurry mixture is diverted to a bypass line running down to the bottom of the slurry hopper. This bypass stirs and agitates the water and media to create a consistent slurry mixture is fed to the blast gun. Inside the blast gun, the regulated compressed air is injected to further accelerate the slurry and dissipate the controlled amount of water from the slurry flow to process the workpiece surface. Each blast gun is fitted with a nozzle and air jet, and the interior of the gun body is lined with polyurethane for abrasion resistance. Unlike line-of-sight dry blasting techniques that rely on impact or impingement to do the work, Dana-Ridge wet blasting’s process scrubs the work surface. Carried by the liquid, much of the media contact with the substrate is in a transverse direction. By scrubbing the work surface with the wet blast mixture, contamination, surface deposits, scale or burrs are quickly removed and carried away, leaving a very clean surface, free of any surface impregnation from the abrasive media. The removed contamination remains in solution in micron-sized particles and does not become airborne. The wet blast machine is a dustless, self-contained system, and no dust collector is required to operate it. The Dana-Ridge wet blasting system provides a safe and convenient alternative to other cleaning and surface preparation methods that generate hazardous or objectionable by-products that present costly and unnecessary handling and disposal problems. If you have oils, grease or coolant on your product that requires washing and blasting, you certainly will want to consider a Dana-Ridge wet blasting system, since these operations can be combined into a one step process, reducing the amount of part handling, saving floor space and contributing handsomely to your bottom line by saving time and increasing component throughput.